Rose hips can be found in the hedgerows of Britain from late summer through to Autumn. An ancient food… Rose hips, the fruit of the wild rose, have been used since ancient times across Europe, from making wine in Sweden and desserts in Germany to a syrup during the Second World War popularised as a Ministry of Food’s wartime recipe. They are an important source of Vitamin C, A & B and significant during winter months when there is a scarcity of other vitamin-rich plants. Did you know….. A popular name for the wild rose is ‘dog rose’, a name that came from ‘dag rose’ meaning dagger. This alludes to the large dagger like thorns that we so often get cut by when getting too close the rose bush. 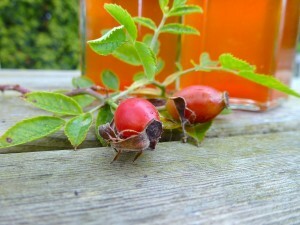 This rose hip syrup recipe can be made to ease the common cold. Research into fighting this air-born virus and ways to combat the symptoms have been linked with the intake of Vitamin C.
Boil 2 litres of water in a large pan. Prepare the rose hips by removing the stalks then mincing. When the water is boiling add the rose hips, bring to the boil then remove from the heat and leave to stand for 15 minutes. Strain the juice through the jelly bag. Return the pulp to the pan and add the remaining 1 litre of (boiling) water. Boil again and leave to stand for 10 minutes. Strain the juice once more. Put the strained juice into the saucepan and simmer until you have about 1 litre left in the pan. Add the sugar and stir to dissolve then boil for 5 minutes. ruthwoolf August 25, 2014 October 25, 2017 Eat out!